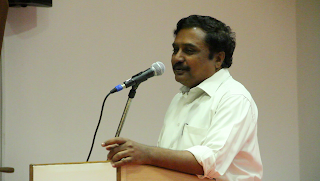 “ஆசிரியன் என்பது ஒரு தகுதி, வெறும் பதவி அல்ல. அதற்குச் சிறந்த உதாரணம் பேராசிரியர் சுவாமிநாதன் அவர்கள்” – இது பேராசிரியர் பாலுசாமியின் அறிமுகம். It is his ability to infect his protégés with enthusiasm and spur them on with passion and purpose that sets Swaminathan apart, sums up Mr Narasiah’s assessment. Narasiah quoted from Swamimalai section of Nakkerar's Thirumurugatruppadai, a Sangam poem. Like the deity Swaminathan, who taught vedas to even his father Shiva, Prof. Swaminathan too is spreading knowledge among the public! It is a reflection of Swaminathan’s versatility that he inspires a fellow professor to admire his unique teaching skill and a writer to admire his power to inspire. It is also such versatility in the paintings of Ajanta that is one of the factors that inspired Swaminathan as a ten year old boy, and has continued to fascinate him for much of his life. 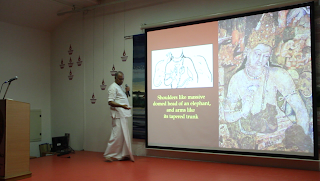 Swaminathans’s presentation of Ajanta was comprehensive. He began with their location and purpose. The caves of Ajanta, in a river valley in the middle of unpopulated jungles, were chosen by Buddhist monks, as places of stay for the four rainy months, called chatur maasya. They were not too far from the silk road of those times, and the ancient Satavahana capital of the 2nd century BC, Prathisthana. And it was perhaps rich merchants and lay people, who carved beds and monasteries and chaityas and sponsored the paintings of Ajanta, as homage to the monks. 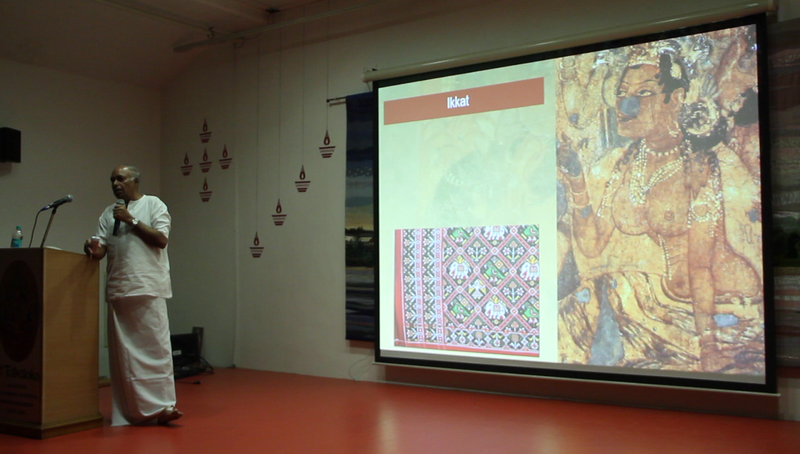 The paintings of Ajanta are truly indigenous, he said, showing Indian characters in Indian settings by Indian painters. By contrast, the Buddhist and Hindu paintings of East and South-east Asia depict Indian characters, even when suffused with native flavor, while the Christian paintings of Europe depict stories from Asian origins. Sadly, they are the only large gallery of Indian classicism, before it changed under the influence of Muslim and European conquerors. The Ajanta school of art seems to be the mother of Indian painting techniques, having heavily influenced the art of Indian Asia. 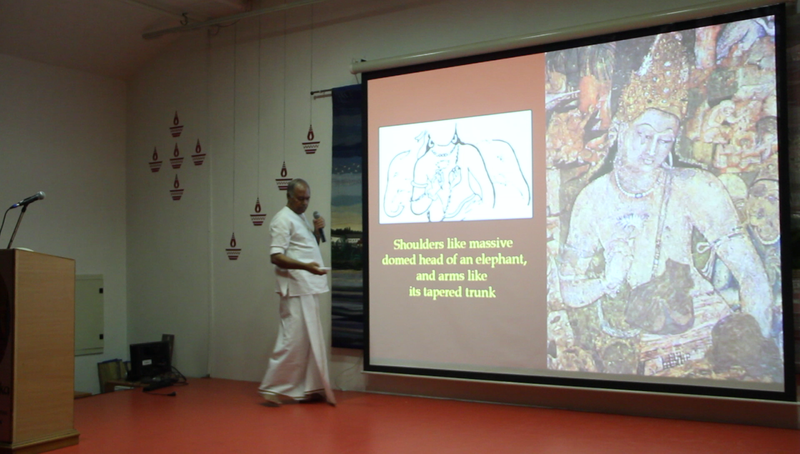 It can be clearly seen that the paintings of other dynasties and regions like the Chola, Pallava, Chalukya, Gupta etc. reflect the Ajanta style, he said. The caves were lost to public memory after abandonment in the sixth century. They were rediscovered by John Smith of the Madras Regiment in 1815. The Royal Asiatic Society commissioned efforts to copy, preserve and document the paintings, by people such as Gill and Burgess. Most of these copies were lost in fire accidents, but undaunted, the stalwarts toiled on, starting again from scratch. Episodes from the Buddha’s life and select scenes from the Buddha Jatakas, are the subject matter of the paintings (and the sculptures). 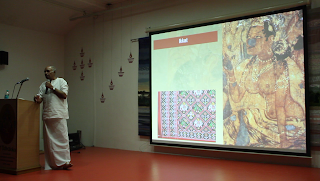 There are some secular scenes and decorative patterns also. But it is the originality and diversity of representation that make Ajanta stand out. Scenes are not painted in sequence but often by their setting. Even the technology of using dry plaster in Ajanta differs drastically from the European tradition of wet plaster, he said, explaining why eight centuries of paintings survive. Texts on painting like Vishnu Dharmottara and Chitra sutra closely reflect the guidelines used by Ajanta artists. He compared the paintings of Ajanta to the sculptures of the Pallavas and the Tamil poetry of the Sangam age, in the glory of their classicism: all three, in his opinion, show a sophistication of theme never since matched, much less surpassed. While in the west, once a new technique is discovered, all old ones seem to be abandoned, Ajanta artists never discarded anything, he observed. Perspective, multiple vision, fore-shortening, coloring even for luminosity and depth, shading with lines, dots or washing – called patraja, binduja, airika - the Ajanta community’s pastel of techniques surpassed their pastel of colors! Swaminathan also showcased various aspects of Indian life, belief, custom, culture, clothing, jewellery, beliefs etc. that Ajanta reveals to the discerning viewer. For example, the shops depicted in the paintings look similar to shops today. While people thought knitting and tailoring were Muslim imports into India, socks and salwar kameez and ikkat pattern in the characters’ clothing, exposes these as false. Enigmas abound – why are royalty depicted with minimal clothing, while the lower classes are often fully clothed? Why has every wall and column been painted? Why go to the trouble of painting the ceilings? Why is there so much sensuousness and joy depicted – after all these caves were the dwellings of monks who had renounced the pleasures of daily life! What prompted the artist to sneak in humor, wit, snide observation and the petty jealousies and mundane aspects of life? An interesting Question and Answer session followed, with questions on carbon dating, Persian influence, etc. Swaminathan expressed his delight at having gone on a site seminar to Mamallapuram, Ajanta and Ellora and Pudukottai, with like minded people who have shown curiosity and enthusiasm in learning about our heritage and have assisted in efforts to spread awareness and pride. He regretted local ignorance of such treasures. Gopu concluded with an invitation to the general public to join the group and participate in its monthly activities, site seminars, use their website and invite their friends. He expressed pride in Swaminathan’s efforts to create another Asiatic Society out of the Tamil Heritage Trust.